C is, and always has been, an outdoorsy child. He would spend all day running around and playing outside if he could. 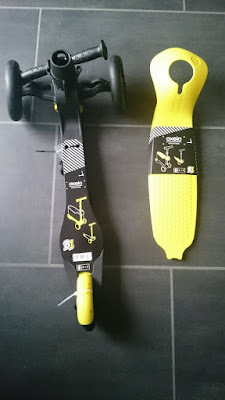 We own quite a lot of outdoor toys so when we were offered the chance to try out a Oxelo B1 scooter from Decathlon, of course I said yes! C actually already owns a scooter but he struggles a little with it. I was hoping that this one would be easier for him to manage. This one is aimed for 2-4 year olds so I thought it would be perfect. Firstly, I love that the scooter is customisable. You can purchase the chassis for £22.99 then the shells are £2.99 each and you can choose from green, yellow, red, pink or blue. This means that straight away you are able to tailor it to your childs tastes or you can purchase them all and change when they want! It just needs a few screws. I'm usually rubbish at putting things together and building but this is totally foolproof. Once it was together, C couldn't wait to get going! I had a little play around with the height (there are 2 levels) and C at 3 years old only needed to use the lower level. This means that he has plenty of room to grow and will be using this for quite a while to come. The fact that it is a three-wheeled scooter gives him reassurance and he could manoeuvre it well too. This isn't a tilt scooter which is what his previous one was but more of a "normal" scooter so he finds it much easier. Our first outing with the scooter was to my parents house. C loves playing out in the garden so I folded it and popped it in the basket of his little sisters pram. Folding the scooter is simple and I love that there's a little rubber bit to keep it together. I honestly couldn't feel any extra weight on the pram so it's great for when we're out and C can't be bothered scooting - I can carry it easily! C has had so much fun playing on his new scooter and it's definitely become a firm favourite in our household. 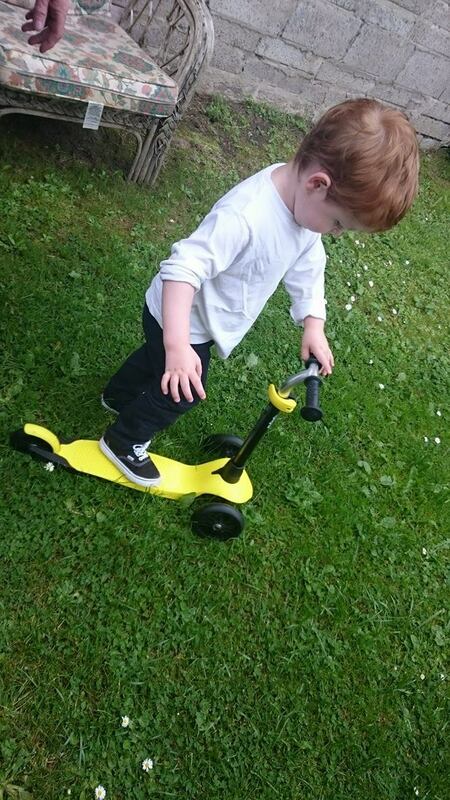 The grip on both the base and handles means he can scoot along comfortably and have little or no tumbles off! You can purchase the B1 Scooter and coloured shells directly from Decathlon.